Astoria celebrates its Scandinavian heritage throughout the year, but especially at the summer solstice when days are the longest and nights the shortest. The annual Astoria Scandinavian Midsummer Festival transports visitors back across the Atlantic, celebrating music, dance, food, and traditional Midsummer activities throughout the three day festival each June. Retail booths offer Scandinavian import items, handcrafts, and traditional Scandinavian foods such as, Finnish pancakes (pannukakku), and meatballs (frikadeller). 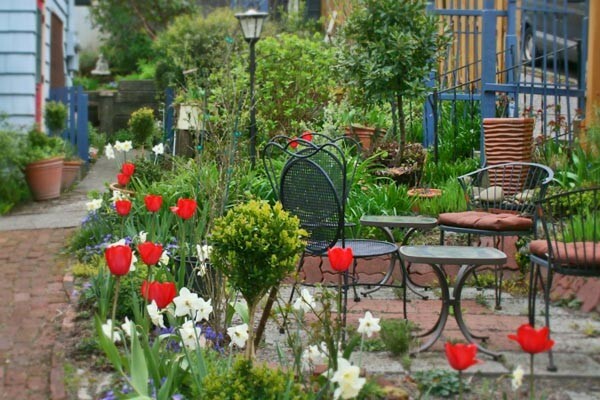 When you stay at Clementine’s Bed & Breakfast for Astoria’s Scandinavian Midsummer Festival, you’ll be treated to Scandinavian dishes as part of your gourmet breakfasts. As a special treat this weekend, Judith prepares a variety of pastries based on Swedish and Danish recipes, and the beloved ebelskievers (fluffy Danish pancakes filled with jam) of course! The 2018 Festival will be held June 15-17, 2018. Highlights include a Torchlight Parade and Bonfire, the Festival Parade with Midsummer Pole raising and ring dancing, the Running of the Trolls, and the Empire of Chivalry and Steel’s Viking encampment with demonstrations of medieval crafts, tournaments, armor making, and combat arts. Scandinavian meals abound, from a Viking Dinner, and the Midnight Sun and Pannukakku Breakfasts to Aebleskiver and Meatball Eating Contests. 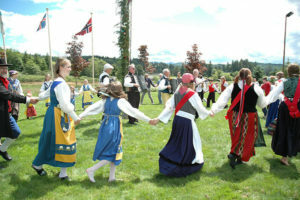 The annual Scandinavian Midsummer Festival is held the third week of June each summer at the Clatsop County Fairgrounds. For more information and the schedule of events, visit the Festival website. Astoria traces its Scandinavia heritage back more than a century to the waves of immigrants who arrived in the area during the last decades of the 19th century. The railroad’s completion from San Francisco to Astoria in 1870 meant easier travel for these immigrants from California north to Oregon to settle. They came from Finland, Norway, Sweden, and Denmark, driven from their homelands by poverty and the collapse of traditional farming methods in the Scandinavian peninsula. Many were fishermen, loggers, and farmers. 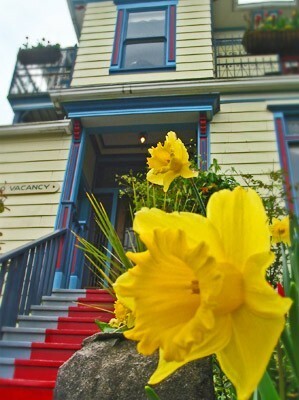 By 1910, 35% of Astoria’s population was Scandinavian. Soon, visitors will be able to learn about Astoria’s Scandinavian heritage year-round at Hipfish: Astoria Scandinavian Heritage Park. The park is to be constructed at 16th and Marine Drive, near the waterfront and Riverwalk. This location close to the Columbia River will pay tribute to the contributions of all waterfront workers as well as the Scandinavian immigrants and their descendants. Hipfish will be located about 10 blocks from Clementine’s Bed & Breakfast, easily accessible by foot or Astoria’s Riverfront Trolley. The site of the Midsummer Festival is just four miles away, less than a ten minute drive. Don’t wait to go online or give us a call to book your stateside Scandinavian Midsummer Celebration in Oregon – no airfare required!